Now, anyone who can afford it wants their own chef. 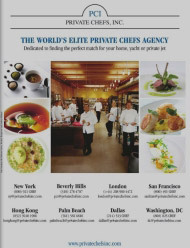 It’s becoming a big status symbol," said Christian Paier, the owner of Private Chefs, Inc., an agency in Beverly Hills. It doesn’t matter if you’re vegan, only eat Thai food or four-star French, have allergies or need to travel on a moment’s notice, Private Chefs Inc. can provide the perfect chef to attend to your needs. If John Travolta, Will Smith and Tina Turner can indulge in the luxury of a personal chef, why shouldn’t you? These and other stars have been clients of Private Chefs, Inc.